I'm so very sorry that this post has been so long coming. Things have been a little manic these last few weeks and truly I am not sure how on earth it is already February this Saturday. Before we know it Easter will be here. I'm so looking forward to spring this year with two babies being born. My brother and sister-in-law are expecting their first little bubba and then, just after, Billy (my eldest) and his partner are going to make us grandparents for the second time. I truly can't wait and I have been buying up baby clothes like they are going out of fashion. It seems like every shop with cute baby bits has a magnetic hold over me. Start by slashing the chicken (3 on each breast) and the same on the legs, now sprinkle inside the cavity with the chilli flakes a little salt, pierce the lime a couple of times with a pointed knife and pop into the cavity. 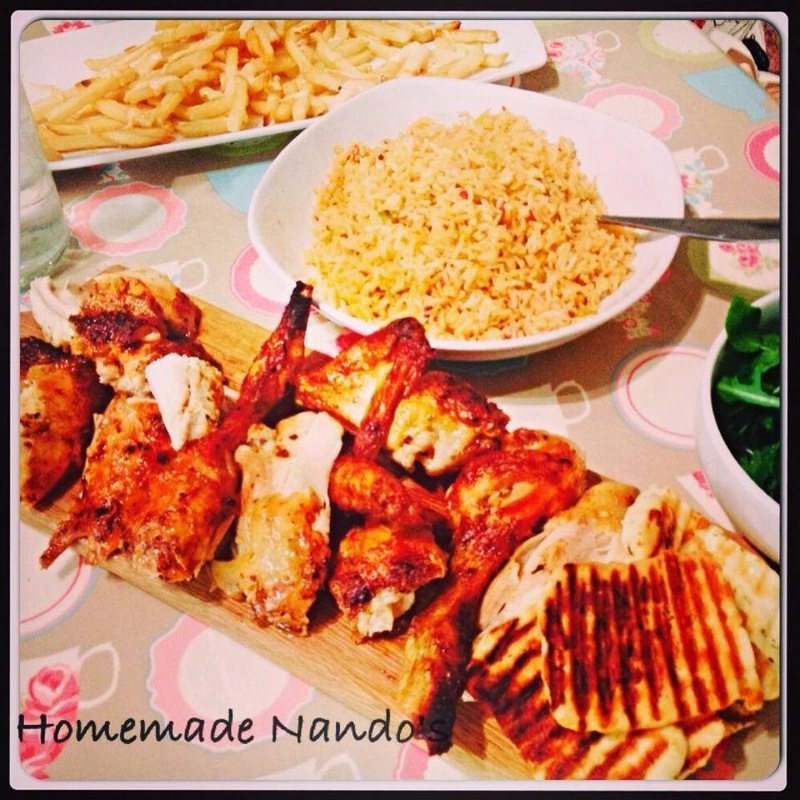 Pop into a large roasting dish and smother with the peri peri sauce. Cover with foil and roast at 190 for 1hr 30 mins. Uncover, baste in the sauce and then roast for another 15-30 mins (depending on the size of the chicken). Start by chopping the spring onion and pepper into small even pieces, heat the oil over a medium in a large pan, sauté the vegetables until they start to turn soft. Now add the rice, stir until all of the rice is translucent, now add the spices and stir. Then add the stock, turn up the heat, bring to the boil, cover, turn off the heat and leave until all of the liquid has been absorbed. Slice the Halloumi into 4-6 slices, drizzle with oil, then sprinkle with oregano. Now put the griddle on over a very high heat, when the pan smokes add the cheese and sear each side. Cook or fry your skinny fries (which ever way you prefer), then mix 2 tbsp of peri peri sauce with 3 tbsp mayo, add a large blob to each serving and sprinkle with ground cumin. I serve with griddled pitas and a rocket salad.